This will provide you with COMPLETE fallout protection. and get his cooperation by offering to share the shelter. for you to put in a shelter at the moment. Have them towed to a junk yard. (If they are not already there). Have them stripped at the junk yard. EXCEPT for the back axle and wheels. a. Remove ALL glass. d. Have front cut off back to door way (including engine compartment frame) (Stripping cost about $200 each). And store at wrecking yard. Schedule to be brought to shelter site by tow truck (which is to take back rear wheels). Purchase 16 sheets of 3/4inch construction grade (cheapest) plywood. (Less than $500). And store at shelter site. Purchase (3) 12 feet long 32 inch (or larger) in diameter heavy corrugated culvert. (Less than $500). Purchase 4 rolls heavy grade tar paper (Less than $200). Purchase 2 ten gallon containers of tar (Less than $100). Purchase 2 application brushes and tarpaper sealing tape. (Less than $50). Purchase from scrap yard (2) twelve foot lengths of material that can be used as steel ladder. Store all of the above at the shelter site. to fit the buses together. (Less than $50). Schedule backhoe for 1 ten hour day. (About $500). Schedule two backhoe helpers (Less than $300). Schedule Welder to come in afternoon for 4 hours. (Less than $400). Dig long enough for two buses. and let the buses settle - when you backfill. or backhoe can lift (drop) them in. Have tow truck bring torch and cut off back wheels and take them away. One truck can bring one bus at a time if distance not too great. truck can start bringing them early in the morning. Drop buses into hole FACE to FACE. Have welder weld together with SUPPORT between the two buses. Have welder cut one 10 foot length of culvert in half. Have welder weld halves HORIZONTALLY to OPEN rear door bus openings. Have welder weld (2) other 12 ft. culverts VERTICALLY to horizontal culverts. Have welder cut entrance between Vertical and Horizontal culverts. Have welder weld in two ladders. use portable generator to run skill saw to cut and place plywood along windows. Mainly so it stays in place during back fill. holding double 2x6 against the roof. Not everyone does this - but see the story below. or for greater security leave them in permanently. Cover shelter with tar paper. especially around joints on culvert and culvert to bus. break or weaken the rib structure. and a foot above ground. for bringing in power lines, telephone, etc. and run out a two or three feet before turning towards the surface. and then make a 180 degree downturn towards the ground. will not contain enough that it needs to be filtered. depending upon bunk arrangement and so forth. and two escape /air intake hatches. that I have come up with to date. but any three buses will do. have especially high standards for ribbing strength. We built ours out of old furnace inserts. but you need about 6 feet diameter for the entrance. a person over six feet tall will have plenty of headroom. You will also need to build some steps inside it. I emailed you about a year ago about ventilation on a bus. Got the bus towed to my property a month ago. Stripped inside, removed front fenders, and put plywood over windows. The track hoe and dozer arrived last Tuesday 5-25-04. Covered bus with 6mill black plastic, spread plastic in hole, then wrapped and tacked to the sides then spread another layer over the entire bus. Then coveered with felt paper. PVC vent pipe was installed and dirt filled around sides. About two feet of dirt was placed on roof. About one hour after the equipment operators left, my wife and I were standing in the area and whooosh the top of the bus caved in!!! 20 feet of the 25 foot bus caved in to the floor. What went wrong? I lost everything, the bus, tools, lumber and supplies, it took me a year to pull this project off. I lost two thousand dollars not counting my time, in less than five minutes I would have been inside the bus. I wrote the builder twice, trying to find out what went wrong. But, I can only speculate - since he never responded. and I was now wondering if it was a school bus. I want to use a 48 pass. bus for my shelter.I donot understand how you make the entrance. I thought about going in from the top. Also not clear on the ventilation. Any info you can give I would be thankful. b. I never discussed with him issues of soil and many other things. Usually, people get back to me for further guidance as they progress. c. Many of the things that I now stress as IMPORTANT on this web page, I have added because of this experience but while I have heard of many bus fallout shelters being built this is the first catastrophe that I have heard of. d. I questioned how the backfilling took place. The mentioning of dozer concerned me and I could see a dozer pushing the soil in from one side and knocking the ribbing out of square breaking their welds. Worse yet, I could imagine a dozer going over the top and weakening ALL the welds. e. Since we never discussed further - the question of bracing never arose. Even when one uses just soil to backfill, it is best to wet it down and let everything settle over a period of time before removing the bracing. I am very careful about removing bracing. Taking out a little here and a little there at a time. I knock it out with a sledge and have a path picked out to run at the very second. Fortunately, he never got that far. f. When one has not built a concrete shelter it is best to only put a couple of feet of soil on top and to mark off that area with a fence so that no vehicles go across it. Certainly not any bulldozers. Anyway, I give you all this information as caution. But don't be put off by this one person's experience. 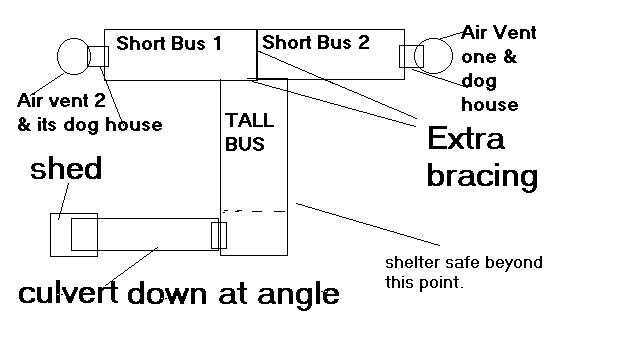 I have heard of many bus fallout shelters, and this is the only disaster (fortunately not a tragedy) that I have heard of - (with the exception of WACO where it took an army to burn them all out and kill the children).